Plan your transit trip, find your best stops, and see your next departures no matter where you are in the Puget Sound region, or where you want to go. 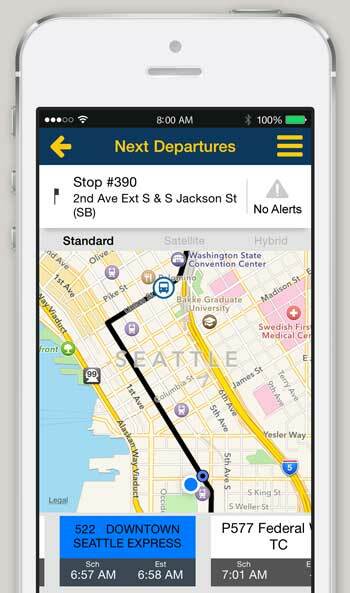 The Puget Sound Trip Planner app does it all and more. It works with all modes of public transportation — bus, train, light rail, streetcar, ferry, water taxi and the monorail. And, it includes a combination of features not found in any other trip planner. Its unique blending of regional trip planning with real-time arrivals lets you navigate the whole region while you’re on the go. Plus, it has all the information and details about your trips — complete route schedules, helpful maps, new ways to customize your trips, service alerts, fares, walking distances and much, much more. Whether getting around Seattle, or commuting from Everett, Olympia or Issaquah, the Puget Sound Trip Planner makes the best use of your time and energy. Get this free app for your iPhone or Android today. Allows cross agency, regional trip planning. Fully customizable trip plan preferences, including transportation mode, walking distance and more. Plan trips using popular landmarks, addresses or your own contacts. Full trip itineraries with fare information, actual walking distance, and map view. Access to scheduled times for transit agencies in the region. Create point-to-point schedules within a route. Search by route or headway sign. Estimated (Est) real time departure times available for all Metro and Metro operated Sound Transit bus service. Provides scheduled (Sch) departure times for all agencies at a customer selected stop. Map and List view of Nearby Stops. Find Next Departures using stop number, address or landmarks. 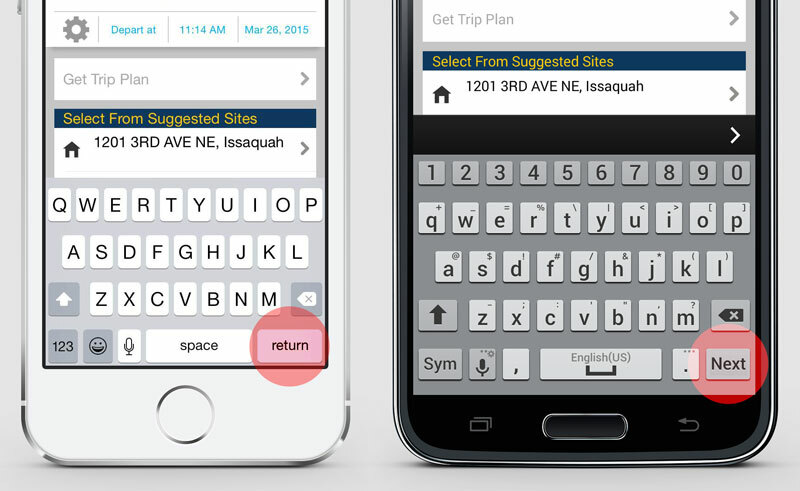 To get the most out of the Puget Sound Trip Planner app, here are some helpful tips to keep you moving and get you where you want to go. If you still have questions please feel free to call us at 206-553-3000. Input a partial address, then select from the list. To improve on the accuracy of trip planning or getting next departures, start typing part of your address (no need for city, state or zip) then select from the "Suggested Sites" list. For example, if you want to get to 1201 3rd Avenue N, Seattle, just type 1201 3rd Ave N, and choose your desired location/city from the list of Suggested Sites. Please note that you may have to wait a few seconds for the app to search for a match. The Suggested Sites list will appear at the bottom of the screen. Tap the star to save a favorite. In Next Departures, tap the star (Save) to add the location to the Favorites list. You can tap the star only for locations (such as addresses, landmarks, intersections, and stops). Then from the Favorites screen you can easily plan trips to/from your saved locations, or get Next Departure info. Pretty handy. iPhone: Tap the "return" button on the keyboard. Android: Tap the "Next" button on the keyboard. What was the motivation for creating the trip planner app? The smartphone app is part of a larger trip planner upgrade project. 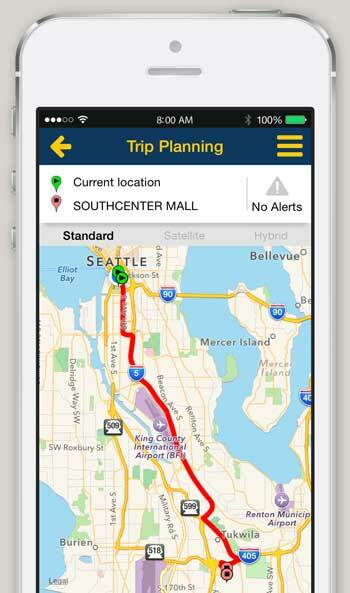 Beginning with recent enhancements to the King County Metro desktop trip planner and the introduction of Metro's mobile web trip planner, the trip planner app is intended to be an additional tool for providing customer information on the go. Who do you hope it will benefit, who are the key customers? The Trip Planner app is for everyone who rides transit in the central Puget Sound region. Commuters, residents, out of town visitors…anyone! With so much local transit information at your fingertips, there is something useful for all transit riders in the region. What are the top three features riders will benefit from? Fully customizable, cross agency, regional trip planning with map views. 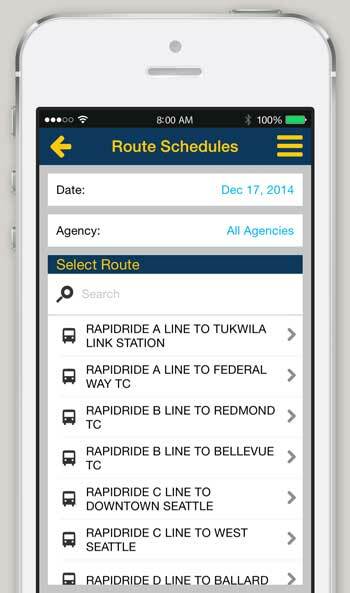 Access to transit schedules for the entire central Puget Sound region. Next departure information at customer selected stops. 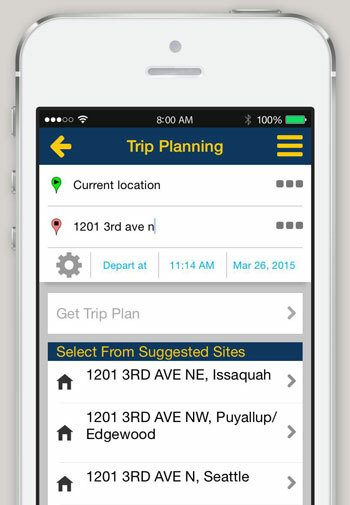 How much did the regional trip planner app cost King County Metro? The contracted amount to create and implement an iOS and Android trip planner app and provide additional support was $80,379. The app is part of the overall trip planner upgrade project which consists of multiple efforts. The duration of time from initial app requirements until availability in the app stores will have been 8 months. 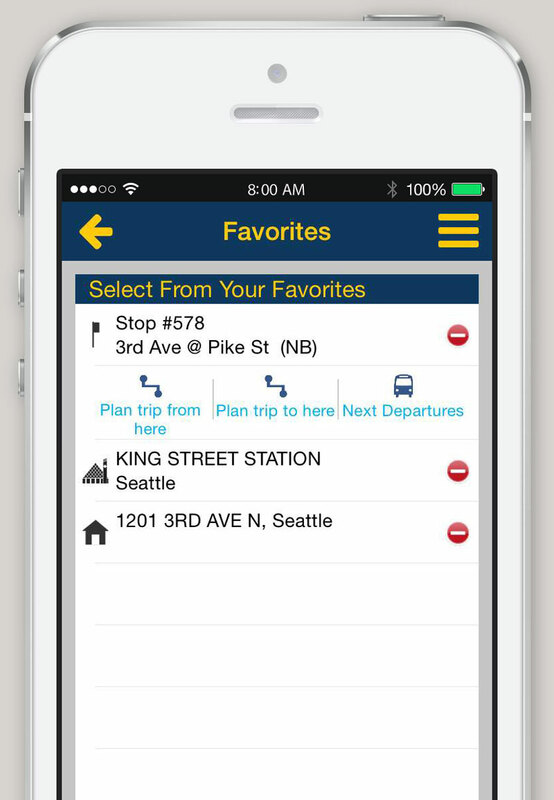 King County Metro contracted with Trapeze Software Group, Inc. for updating our desktop trip planner, creating a mobile web trip planner, and the creation of iOS and Android trip planning apps. What kind of monitoring/updates are planned to address customer feedback? As the official owner of the app, there is an in-app Send Feedback feature that delivers comments and suggestions directly to King County Metro. Customer feedback will be taken into consideration for planning all future app enhancements. Why was the app not created for Windows Phones? The initial contract with Trapeze Software Group, Inc. only provided for the creation of an iOS and Android version of the app. We are exploring with the vendor the ability to create a Windows Phone version in the future. Why spend money on a trip planner app? Smartphones are a way of life now, and smartphone users love apps. This presented an opportunity to provide central Puget Sound regional transit information to a growing demographic. There are many third party developers that produce other transit related apps, however there is no insurance to the longevity of any of those developers and what could happen to their apps if they move on to something else. King County Metro determined it was vital to offer a regionally supported app that would continue to be maintained internally to provide continuity to customers. How is the Trip Planner app different than the Trip Planner program available on the desktop or via mobile device from the Metro Transit website? All three programs (desktop, mobile web, app) utilize the same trip planning engine and transit data source. The app is designed to work natively with iOS and Android devices, utilizing the capabilities of that device such as GPS, mapping, etc. So, for example, you can easily plan a trip from wherever you happen to be, to another location that you have recently used, or saved. How is this app different than One Bus Away, which Metro and ST also support? Many people love One Bus Away and it is a great tool. The Trip Planner app provides real time Next Departure information as well, but also offers customizable Trip Planning, Route Schedules, Point-to-Point schedules, a regional agency contact list, and more! Trip Planning – allows customizable, cross agency, regional trip planning. Route Schedules – access to schedule times for all transit agencies in the region. Next Departures (scheduled) – provides scheduled (Sch) departure times for all agencies at a customer selected stop. Alerts – links to the service alerts page for each agency. Info – provides access to a Regional Contacts list of all transit agencies. What level of participation did the other regional transit agencies have in this new app? King County Metro led the development effort, with testing assistance and input from Sound Transit. Other regional agencies were invited to join the effort to promote the app to their customers. 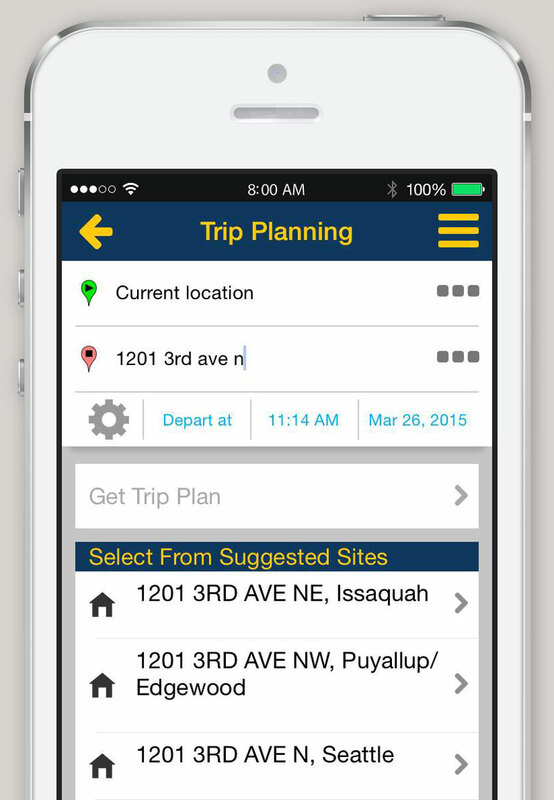 The Trip Planner app is meant to benefit all customers in the Puget Sound region. Are there any new features that will be added to the new Trip Planner app in the near future?